Don't tell me what to do! I'll be as upset as I feel I ought to be! People, women in particular, are often told to "calm down", usually as a way to dismiss their side of an argument by dismissing the validity of the claims based on the emotional reaction. Some things are worth getting upset over. 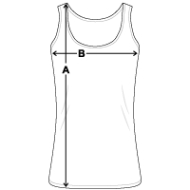 This design is on a longer-length fitted tank top cut for women. Alternate t-shirt styles can be made upon request.